Among all the graduation level professional degree courses, The Bachelor of Business Administration is the course that most of the students prefer to join because it opens many doors of opportunities for them. All businesses in the world require talented managers to run and grow the business. A BBA course is the first step towards becoming a good manager and getting a high paying job. 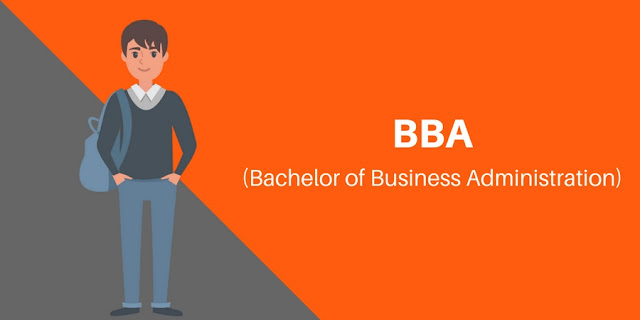 After completing the BBA course, a student can either join a company at the executive level or can go for an MBA program in a reputed business school. As per the data available on popular Salary site PayScale.Com, people who have completed their BBA course are placed with some of the top companies and getting handsome pay. The report also says that HDFC Bank, Genpact, Wipro Technologies, Tata Consultancy Services are among the few employers that hire students with a BBA degree. If you want to join a BBA course through distance learning mode, here are the top 5 universities in India that you may consider other than IGNOU. 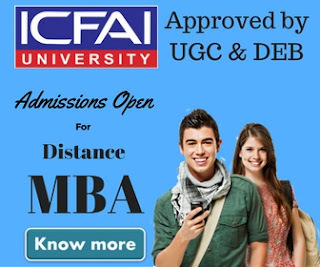 The ICFAI University is a UGC approved university that offers the Bachelor of Business Administration (BBA) Program under distance education mode. The distance education BBA course offered by ICFAI University is a 3 years graduate level degree program that has been designed to give basic knowledge of management to the students looking for pursuing their career in the field of business management. Students who have completed 10+2 level from any discipline can join this course. The course is only available through English medium. Although the duration of the course is 3 years, students can complete the program within maximum 4 years duration. The ICFAI Distance Education BBA course is based on self-study and examinations. The university provides academic material for self-study to all the students who enroll in the course. There are total 18 subjects in the course that are spread over 3 years. Below is the complete course structure for ICFAI BBA course. The total fee for the program for 3 years is ₹ 34,000. Although, if someone opts for the EMI payment option, the fee of the program increases by about ₹ 2000. The examination fee is extra and has to be paid when a student registers for the examination. 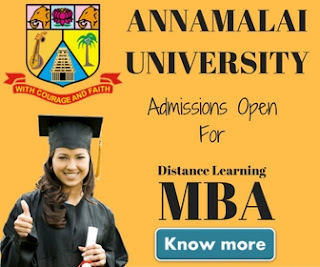 Annamalai University is a well-known university in the distance education space. The university is located in the state of Tamil Nadu and offers more than a hundred courses through the distance education mode under its Directorate of Distance Education. The Annamalai University Directorate of Distance Education (DDE) was established in the year 1979 and has the approval of the Distance Education Council, New Delhi to offer courses under the distance education system. The university offers 2 BBA courses i.e BBA (General) and BBA (Computers Application). Both the courses are of 3 years duration. The BBA (General) is available in English/Tamil medium, while BBA (Computers Application) is available on through English medium mode. The total fee for Annamalai Distance Education BBA course is ₹ 9150. Amity University is a renowned private university of North India located in Noida, Uttar Pradesh. It is also one of the top-rated universities in India for distance education management courses. The university offers over 133 professional courses through distance learning mode. With over With 45,000 students, 133 professional programs, 70 world-class institutions, and 22 campuses, it is a clear leader in the education space. The BBA distance education course offered by the Amity University is a 3 years degree program that students who have completed 12 / 10+2 level of schooling can join. The course is divided into 6 semesters and there is no loss of Semester: if a candidate fails in any subject he can carry it as the backlog to the next semester. The Amity BBA course is a complete online course and all the content of the course is hosted on Amity Server that the students can access through the internet from anywhere, anytime. The total fee for Amity Distance education BBA course is ₹ 112300/-. Suresh Gyan Vihar University is a NAAC ‘A’ grade university located in Jaipur, Rajasthan. The university has best e-campus in the country and offer their programs through online learning mode. The university courses are approved by the joint committee of UGC-AICTE-DEC, New Delhi. The Distance Learning BBA course offered by the Suresh Gyan Vihar University is a 3 years online degree program. The BBA course content includes online lecture, videos, interactive animations, discussion boards, and more. People who have completed their 12th standard education and want to pursue their career in the field of business management can join this course. The medium of instruction for this course is English and people from all age group can join this course. There is no age bar to join the BBA course offered by SGVU. The total fee for SGVU BBA course is ₹ 64950. When we think about distance education courses, Sikkim Manipal University is among the few names that strike to our mind. The university is among the few good names when it comes to distance education. SMU is an award-winning university in India and rank among the top 5 universities in India that offer distance education courses. The Distance Education BBA course offered by SMU is a minimum of 3 years (6 semesters) courses that students can complete in a maximum of 5 years. The course is approved by UGC and is designed to give the fundamental knowledge of business management to the students. Some of the subjects that students will learn during the course are Business Environment, Entrepreneurship Management, Business Strategy, Marketing Management, Organizational Behavior, and International Marketing. All the students will receive printed Self-Learning Materials at the time of admission for self-learning. The Self-Learning Material is also available in digital format through SMU EduNxt. Students who have completed their 10+2 or Equivalent can join this course. The total fee of the course is ₹ 16,250/- per semester i.e ₹ 97,500 for the entire course.